The 2004 Democratic National Convention keynote speech introduced Illinois state senator Barack Obama to the entire nation. He was mere months away from becoming the state's next U.S. senator. And now, in 2017, in front of the entire international community—and near his old stomping grounds—President Obama bid us all farewell. Being at McCormick Place Tuesday night, or even watching the event from home, meant flirting with nostalgia. A press photographer I spoke with backstage shared a photo of himself near the stage at a 2008 Obama campaign event before asking me to photograph him near the stage at Obama's farewell speech. The photo pose and backdrop were nearly identical—he even wore the same outfit he'd worn in 2008. Our chance encounter made me think of a different photo, one that's about 11 years old now. In this photo, a 17-year-old black, gay high-schooler from the south side had just met the author of Dreams From My Father: A Story of Race and Inheritance at a fund-raiser for Facing History and Ourselves, an education nonprofit. This man, this student, and his CPS and suburban high school peers delivered speeches, talked about the book, and discussed about how race and identity color our understanding of ourselves, one another, and our collective histories. This man would declare his candidacy for president of the United States roughly seven months after he spoke to that group of high-schoolers. And that youngster, years later, would attend the farewell address from the press pool, hearing him speak one more time as an elected leader. If you haven't already figured it out, dear readers, that kid was me. I'd be remiss not to mention this brief encounter, however small as it is, because of how it fits within the much, much larger context of Obama's farewell. When I met then-Senator Barack and Michelle Obama in 2006, I felt compelled to discuss not only my racial identity on that stage, but also how being part of the LGBT community affected my coming of age. But I wasn't fully out about my sexual orientation then. Talking about it in front of that audience would have been a very public coming out. So a trusted adviser cautioned me against sharing my full truth that night—it wasn't the right time. In fall 2007, when Obama was gearing up for the primaries, I read his campaign positions closely. There I saw planks targeted at women, African-Americans, LGBT people, Hispanics, and so many other groups that often feel shut out of American political discourse and ignored by national political figures. After reflecting on the Obama campaign's vision and ideas, something flipped inside me. 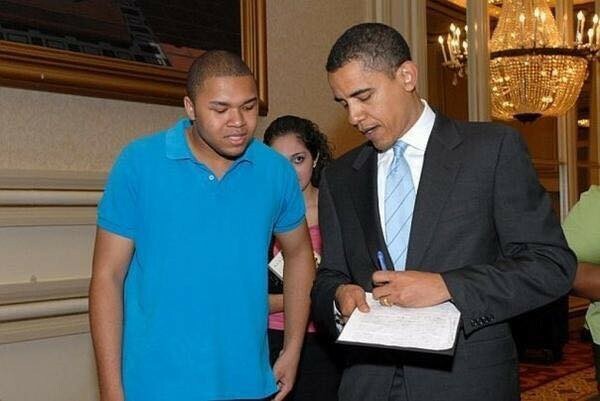 Although I hadn't been able to share parts of my journey with Obama during the encounter I had with him as a high-schooler, in seeing his campaign platform, I felt as if he was listening to me anyhow. People like us—us folks who have often been rendered invisible, disenfranchised, closed off from the halls of power, and denied a seat at the table—were being included like never before. I don't think it takes having multiple marginalized identities, as I did then and do now, to see yourself in that "us" equation. Everybody has their own struggle. Obama's farewell speech outlined just how fraught racial divisions are in America—how fraught they've been for centuries. But he also addressed divisions along the lines of gender, sexual orientation, national origin, disability, socioeconomic status, faith, age, and other identities. The ethos and practice of inclusion Obama championed during his campaigns for the White House will remain an indisputable part of his lasting legacy. For the past eight years, it's been clear that this president—the first African-American president—understood that America's diversity is perhaps its greatest strength. "Democracy can buckle when we give in to fear. 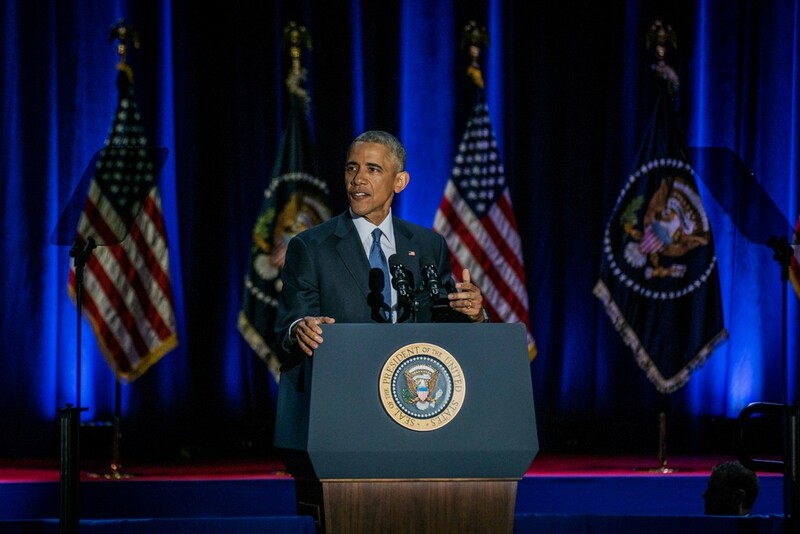 So just as we, as citizens, must remain vigilant against external aggression, we must guard against a weakening of the values that make us who we are," Obama said during his speech. "That's why we've ended torture, worked to close Gitmo, and reform our laws governing surveillance to protect privacy and civil liberties. That's why I reject discrimination against Muslim-Americans," he said. "That's why we cannot withdraw from global fights—to expand democracy, and human rights, women's rights, and LGBT rights—no matter how imperfect our efforts, no matter how expedient ignoring such values may seem." The president hasn't been perfect. Even with all he's done to help marginalized Americans, no one can stake that claim—not even the "leader of the free world." In Chicago and around the country, there's palpable anger about his conferred status as the "deporter in chief"—although Obama helped enact many new protections for immigrants, including the DACA program, he's also deported more undocumented immigrants than any previous president. Indeed, even during one of his most inclusive moments—a June 2015 LGBT Pride Month reception at the White House—he stumbled greatly. No other president had held LGBT receptions before. But when an undocumented Latina trans woman attending the reception interrupted Obama's welcome remarks, expressing how "tired" she was of waiting for Obama to take more decisive action on immigration reform, the president yelled back. "Shame on you!" he shouted. "You shouldn't be doing this!" She was escorted out of the event, as another attendee yelled "Bye, Felicia!" In remarks after the fact, Obama took umbrage with the notion that someone could come into your house, eat your food, drink your beverages, and then shout at you. Obama—a cisgender, black, native-born man—was in a position of privilege here relative to a transgender, undocumented, Latina woman. Whereas he could have engaged her and assuaged her fears, as he'd done with hecklers at public events, security guards took her away. In this moment, and in many others from the Obama years, there's a lesson to be learned: almost anyone can use their power to belittle and beat down those who just want to be included. And yet Obama, perhaps more than any other president, widened the scope of what diversity, inclusion, and even equity can and should look like. He had the audacity to openly welcome new groups into our politics rather than jettison them out of convenience, or over concerns about polling numbers and popularity. Audacious it was. Perhaps that was why he kept asking us to "hope" while working for "change we can believe in," two of his most notable campaign slogans. As Chicago's president closed out his remarks Tuesday, he did so with a familiar reminder to the millions of people still reeling from the trauma and toxicity of the 2016 presidential election. People who since November 8 have asked, "Where do we go from here?" Nearing his crescendo, Obama said, "I am asking you to believe. Not in my ability to bring about change—but in yours. "I am asking you to hold fast to that faith written into our founding documents; that idea whispered by slaves and abolitionists; that spirit sung by immigrants and homesteaders and those who marched for justice," he said, "that creed reaffirmed by those who planted flags from foreign battlefields to the surface of the moon; a creed at the core of every American whose story is not yet written. Yes we can. Yes we did. Yes we can." There's still hope—the hope that once inspired a 17-year-old to embrace his true self and participate fully in American society. The hope he shared with millions of Americans and others around the world. And the hope that will etch his name amongst the greatest leaders in world history. The Obama era will not recede into the insignificance the right wishes for it. While President Obama was making a high-minded appeal to our better angels, BuzzFeed was offering some sordid and sleazy allegations about Donald Trump.